Saturday, April 13th - Childrens Easter Celebration 10:30 a.m. on the front lawn! Saturday, April 13th Parents Night Out 5:00 p.m. to 8:30 p.m. Registration Closed. Sorry, try our May or June Parents Night Out! 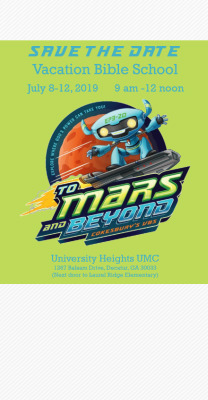 Friday, May 10th - Parents Night Out 6:00 p.m. to 9:00 p.m.
Friday, June 7th - Parents Night Out 6:00 p.m. to 9:00 p.m.
VBS is for children who are two years old (as of September 1, 2018) and potty-trained through students who have just completed fifth grade. Students who have just completed sixth grade or higher are invited to participate as youth volunteers. Please visit our Registration Page to register a student! VBS would not be possible without our fabulous line-up of volunteers. We need youth volunteers and adult volunteers. The cost is $20 per child if you complete your registration by June 13. (After June 13, the price increases to $30 per child, as space allows.) Invite your friends and neighbors! Contact Alison Atkins at alisonhatkins@gmail.com or 404-797-6746 for more information.